A Vatican worker cleans one of the fountains in St. Peter's Square July 25 after the Vatican turned off the water in the fountain to prevent waste as Rome considers water-rationing plans in the midst of a drought. (CNS/Cindy Wooden). VATICAN CITY (CNS) — While Rome reels from one of its worst droughts in decades, the Vatican is doing its part to conserve water by shutting down the city-state’s 100 fountains. 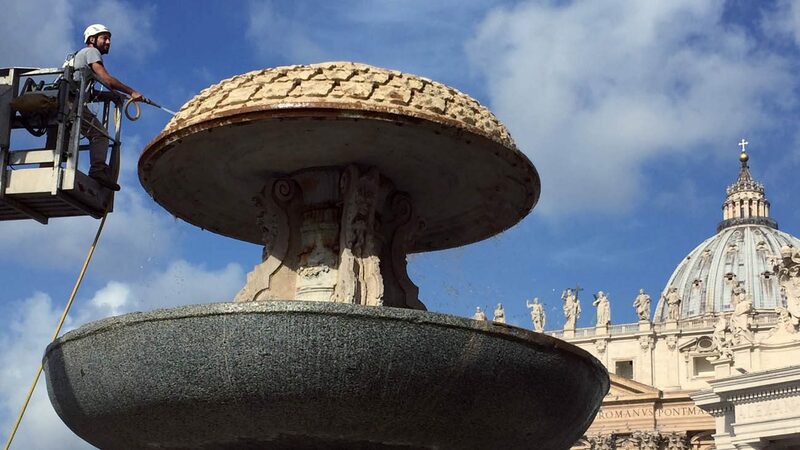 The office governing Vatican City State announced July 25 that the drought has “led the Holy See to take measures aimed at saving water” by shutting down fountains in St. Peter’s Square, throughout the Vatican Gardens and in the territory of the state. “The decision is in line with the teachings of Pope Francis, who reminds us in his encyclical ‘Laudato Si” how ‘the habit of wasting and discarding’ has reached ‘unprecedented levels’ while ‘fresh drinking water is an issue of primary importance, since it is indispensable for human life and for supporting terrestrial and aquatic ecosystems,'” the office said. The prolonged drought has forced officials from the Lazio region of Italy to halt pumping water from Lake Bracciano, located roughly 19 miles north of Rome. Less than usual rainfalls in the past two years have steadily depleted the lake, which provides 8 percent of the city’s water supply. While the drought already forced Rome city officials to shut down some of Rome’s public drinking fountains in June, it may lead to strict water rationing for the city’s estimated 1.5 million residents. City officials may also take the Vatican’s lead and shut down water pouring down from Rome’s many ancient fountains. Pilgrims and visitors alike have marveled at the majestic fountains of St. Peter’s Square that have cascaded water for centuries since their construction in the 17th century. While the source of water was once provided from an ancient Roman aqueduct, the two fountains, as well as 10 percent of Vatican City State’s 100 fountains “recirculate water currently,” Greg Burke, Vatican spokesman, told Catholic News Service in a July 25 email. Others, he added, “will eventually be transformed in order to recirculate” the same water rather than let it be wasted by running into the drainage or sewer system. Burke told CNS that the Vatican’s move to switch off the fountains located within its territory is “a way to show a good example” in conserving water as the city deals with the crisis.